Response: After Hidden Cache is discarded from your deck, add 2 resources to the resource pool of a hero you control. Action: Spend 1 resource to draw 1 card. Combat Action: Each Rohan hero can be declared as an attacker against enemies in the staging area this phase. 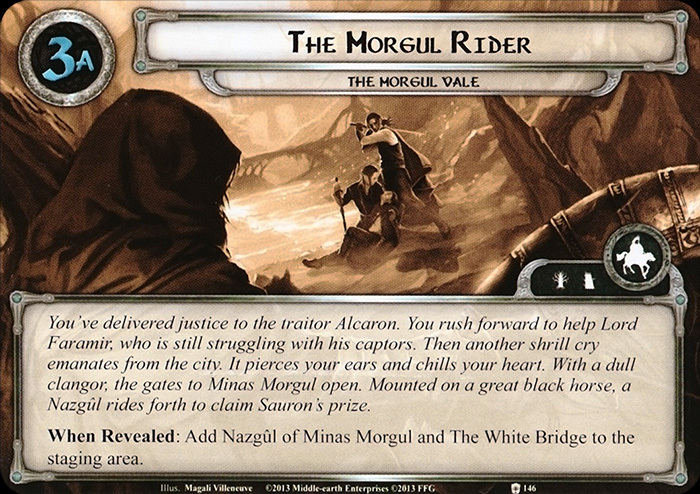 Set aside Lord Alcaron, Nazgûl of Minas Morgul, and The White Bridge. 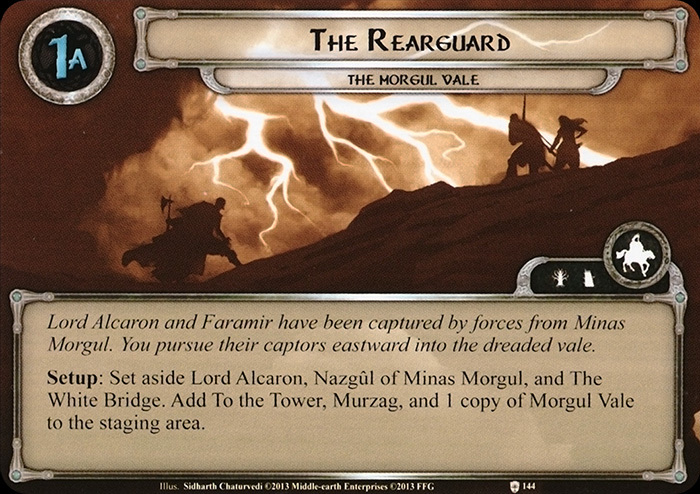 Add To the Tower, Murzag and 1 copy of Morgul Vale to the staging area. Murzag cannot leave play unless destroyed. If Murzag is defeated, advance to the next stage. 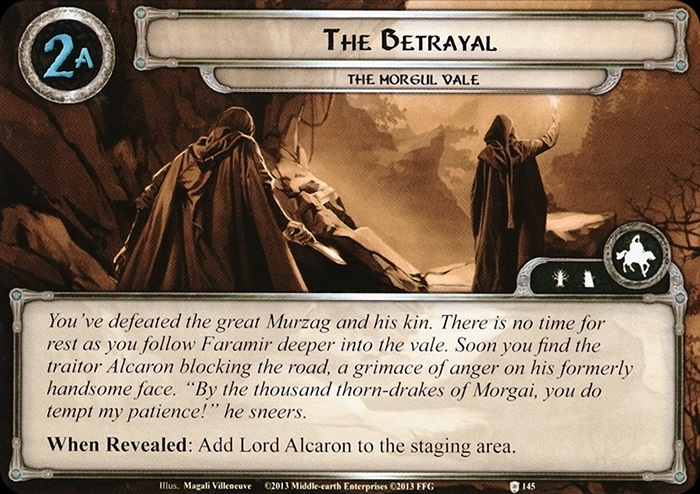 When Revealed: Add Lord Alcaron to the staging area. Lord Alcaron cannot leave play unless destroyed. If Lord Alcaron is defeated, advance to the next stage. To the Tower cannot leave the staging area. Remove Faramir from the game. If 10 or more progress tokens are on To the Tower, the players have lost the game. When Revealed: The first player either places 3 progress tokens on To the Tower or reveals X additional cards from the encounter deck and adds them to the staging area. X is the number of players in the game. 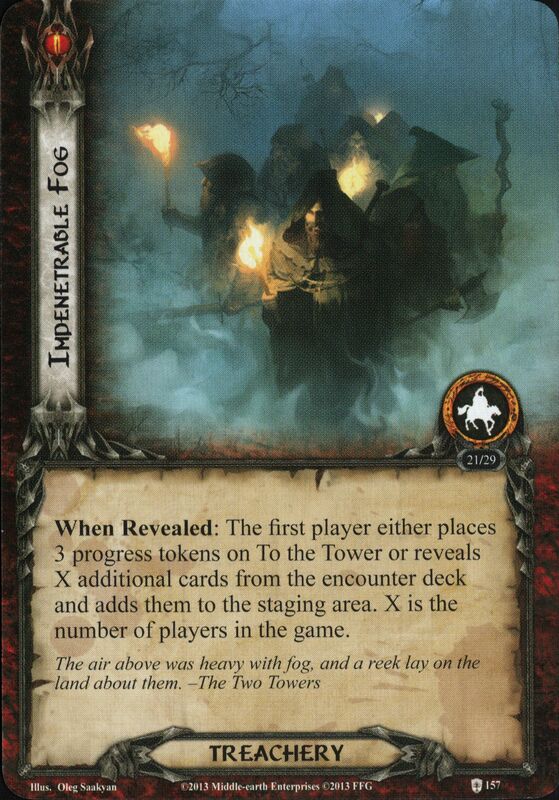 When Revealed: Each player must discard 3 random cards from his hand or place 1 progress token on To the Tower. When Revealed: Place 1 progress token on To the Tower.